Something I didn't know was there, but again, it's one of those hidden new gems buried inside of Snow Leopard. You know when you minimize an application to the Dock, the Dock places the minimized application over on the right hand side of the dock, next to your stacks and the trash? 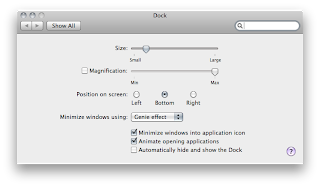 "Minimize windows into application icon" is found in the System Preferences under "Dock". After you click this, the next time you minimize a window, it will go into the dock icon, instead of making your Dock longer. Plus this also fixes the annoying task of, after you minimized something the old way, you click on the Application icon expecting the minimized application on the right hand side of the Dock to maximize into the screen. Well, the system doesn't do that. Unless you have this button checked. There IS good left in the world!